Those stepping into today's Erie County Public Library aren't just entering a repository of information; they are entering a transportation hub toward new skills and opportunities they may have never known they had. According to Erie County Executive Kathy Dahlkemper, beyond the collections, its aim is to foster connections between the citizens and community it serves. Card catalogs. Stacks and shelves of books. The ubiquitous, permeating "sssshhhhhhh." Blessing bags. Voting machines. The chorus of creation humming from 3D printers, sewing stations, and vinyl cutters. Google. In 2019, books still abound, and the notion of what libraries are — hubs of information — remains the same. But the ways in which they serve their communities is changing. At the Erie County Public Library, Pennsylvania's third largest public library facility, that evolution is by design. "It's always been about collections, but I think libraries are moving to be more about connections — how do we connect our citizens with each other, how do we connect them to resources, how do we have that public space for discourse," says Erie County Executive Kathy Dahlkemper. 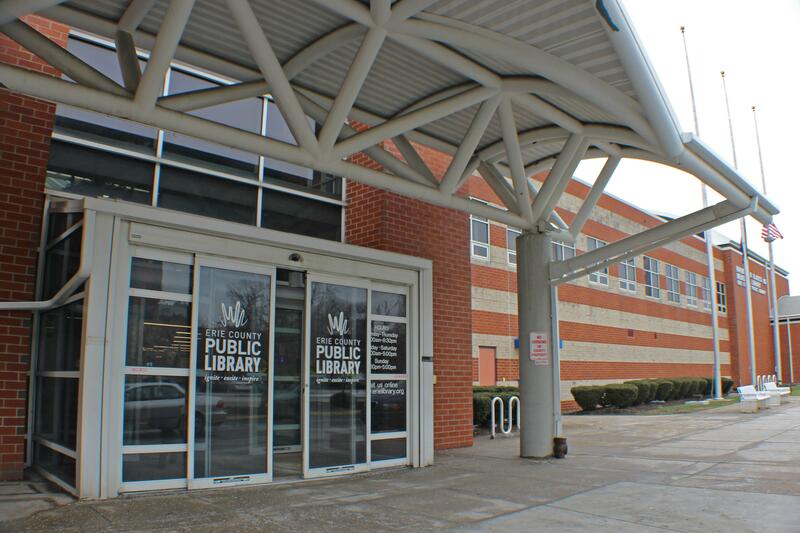 In Phase 2 of its Strategic Plan, Erie's Library is finding ways to connect to an underserved population: Teens. On Saturday, Feb. 9, the Blasco Library — the Public Library's flagship site, which has operated on Erie's Bayfront since 1996, continuing a legacy of service to the Erie community that began in 1897 — officially opened its Teen Space. "What we found was that the demographic group we were reaching the least was teens," Dahlkemper says. "The Teen Space will provide a place to convene and come together as well as to utilize what we have: Our Idea Lab and our Media Lab and all of the other resources in the library." More on the Idea and Media labs — which were part of the Strategic Plan's first phase — later. "Teens are often a forgotten segment in libraries, and it's the group that, in many ways, matters the most," explains Erin Wincek, executive director of the Erie County Public Library. "If you lose them when they're teenagers, they often never come back again. Having a space like this really matters. While they had a space upstairs, it was out in the open but anyone could stumble in there. This space says: We really value you; we're going to invest in you." That investment comes by way of a $100,000 donation from the Erie Regional Library Foundation with matching grant funds from Pennsylvania Department of Education's Office of Commonwealth Libraries to total a $200,000 upgrade. While each of the branch locations of the Erie County Public Library feature nooks and corners for teens to gather, the new Teen Space at the Blasco Library offers an area specifically dedicated to that age group — a space of their own with a sense of permanence. And that space is open to teens countywide. "We would have pop-up programming, but we had to use adult programming rooms," notes teen service librarian Tammy Blount. "I'd load up a cart and take it into a room and it was temporary in a classroom setting. Now, this is so multipurpose…"
The this features a performance area, including a ramp to provide accessibility for all populations, easily rearrange-able furniture, and a laptop bar with a stunning view of the bay. Prior, the space played home to music and video collections, which are now upstairs. Also prior, young adult nonfiction and fiction were interspersed within the library's larger collection. Now, teens can find material specific to them in a space specifically for them, including Monica Hesse's The War Outside, which the Teen Reading Lounge recently used and which inspired the group to assemble "Blessing Bags," an effort that garnered statewide attention from the Pennsylvania Humanities Council. A book club of sorts with an eye on social impact, the teen-led initiative took a key message of Hesse's work to heart and pondered how they could help their own community. That led to a call for donations to assemble "Blessing Bags," containing anything from toiletries to clothing, such as socks, hats, and gloves, and more to be distributed to Erie's homeless population. "We encourage the teens to be civic-minded when they're reading a story: How does it not only affect you but how does it affect your community?" Blount says. "They decided to take donations to put the bags together." The bags landed the group on the Pennsylvania Humanities Council's radar. And the article the organization's website landed the initiative on the Hesse's radar. "The author of The War Outside tweeted out that 'her heart was bursting,'" Blount adds with excitement. With guidance and support from Blount, a Teen Advisory Board of roughly a dozen active teens shapes the programming at the library for their age group and even had critical input on the design on their new space. The teens host various programs throughout the year, with a ramped-up increase during the summer when school schedules become less demanding. Of most popular note: Cos Prom and Nerf Wars. "It's just what it sounds like," Jude Shingle, emerging technologies librarian, says, laughing, as we tour the Teen Space with Blount and Wincek before Saturday's grand opening. "Out of the 500 Nerf pieces they used during the lock-in event for the teens, we only found about a dozen afterwards," Blount says, sharing in the laugh. "One of our biggest programs that teens are instrumental in is Comic Con," Blount explains. In short, Comic Con has become an annual event held in partnership between the library and GeekERIE dedicated to the appreciation of many things comics-related, including cosplay, dressing up as one's favorite comics character — a "vital piece of any Comic Con," Erie Reader's own Managing Editor Nick Warren noted in a 2016 write-up on the event. So: Comic Con plus Prom equals Cos Prom. "We get thousands of people here," Blount continues. "The Teen Advisory Board decided to do a Cos Prom the night before the Comic Con. They picked out all of the decorations, the DJ, and were involved in all of the aspects of what it takes to do something like that. And it could've been a complete flop, but we had 150 teens dressed up at a dance and they filled the whole front lobby. They put the lights up and volunteered the whole time." And this year, teens will be able to take advantage of the Performance Center, signing up for half-hour blocks to present and/or perform — all in a dedicated space of their own. That space, like the Idea Lab, is walled off, access to which is gained by going through doors. And also like the Idea Lab, there's a fish-tank approach to the layout, with glass windows running from the ceiling to about three feet from the floor. That, too, is by design: Get people walking by to stop and to look, to take note of the new exciting things happening at a library. That can now range from a curious pre-teen looking for where to hang out next in Blasco to someone looking for help sewing pants or an entrepreneur looking to launch a business. "It's exciting — the energy built from creating the Idea Lab and the new people that that's brought into the Library," County Executive Dahlkemper says. "It's not just about the Idea Lab, as a space itself, but all of the courses that have been borne out that and the connections it builds." "The cool thing is that people come in to convert a VHS of their wedding and end up stumbling upon a new skill that they never would've imagined — or just meeting someone," Wincek says. "Just the other night, someone came in during our Monday Maker's Program, which is our open drawing program, to convert a VHS to DVD. While it was converting, she asked, 'can I stay during the program?' And we're like, "Yeah! Awesome!" adds library assistant Marcy Hall. This intersectionality is intentional with the Idea Lab — a place, well, brimming with ideas. "Relationships are formed," Shingle adds. "People who'd never otherwise meet each other meet each other." A guy walks into the library carrying a pair of pants. This is not the start of a corny joke; he tore them while shoveling snow. But rather than tossing them aside or away and investing in another pair, he heads to his local library and says, "I don't know how to do this, but I know you have sewing machines…"
And, indeed, the Idea Lab does have sewing machines. And it also has librarians who can help. But sometimes bumpability happens first. "Wouldn't you know it, a lady walked in to convert a VHS to DVD and saw him bumbling around with the sewing machine and said, 'You know, I'm really good at that if you need help,'" Hall recounts. "She taught him how to sew, made him do all of the work, and they were here for two hours while her project finished, and then she was like 'Okay, I got to go; you're on your own now.'" "He comes in all of the time and says 'I still have my pants!' And he'll show me them," Hall says with a smile. "It's really cool — seeing people help each other. It's the best part of having random people all day." Aside from sewing machines, the Idea Lab, which opened in late 2017, features a vinyl cutter, a Cricut cutter (multipurpose cutting device) , and more — just in the craft corner alone. Since its launch, there's been a steady increase in traffic, from crafters to converters (the Idea Lab currently features the VHS to DVD converter and is exploring a floppy disc convert) to those frequenting the likely most recognizable part of an Idea Lab: 3D printers. A row of four UltiMaker 3 units greet guests as they enter the Idea Lab. A high-end consumer model capable of professional grade work, the machines can print two materials at once. Popular amongst users now: Lithophanes, pictures printed in plastic with varying degrees of thickness so that when the image is played in front of light — like, say, a night light — the picture becomes stunningly clear. "Once you make one for one family member," Shingle says, "the rest, well, they're going to want one, too." Also on display next to a lithophane, sits one green leg of a Christmas tree stand. "A woman came in because her Christmas tree stand broke," Shingle explains. "Rather than buy a new one for $25, she printed a new part for two bucks — and she didn't even have to design it. Most of the designs for what people print here are online." Patrons pay per gram of plastic (poly lactic acid, which comes in spools resembling wound spaghetti noodles are mostly made of Midwestern corn and are biodegradable) material used at the rate of 10 cents per gram. "Not best to make your garden gnomes from," Hall jokingly advises about the biodegradability and the library's effort to be sustainable. But when kept out of direct light, PLA can be used to make tools, she notes. Aside from the 3D printers, the Idea Lab features a professional-grade large format printer that you might mistake for a Casio keyboard capable of printing 36" x 72" posters at just 5 bucks a pop, laptops for general design work, computers for specific design work, computers with the entire Adobe Creative suite, audio-editing software, and more — all making it possible to launch or continue a business. Patrons are able to reserve stations in two-hour increments but can continue working beyond two hours if no one is waiting behind them. The same rules apply to the Media Lab, where there's a green screen, and a computer station with editing software. Shingle notes that at least two podcasts are being recorded per week, and Wincek adds that a patron who was able to launch his business out of the Idea Lab is now able to record segments for his YouTube channels there. And performers are welcome, too. While Shingle hasn't seen an entire band squeeze into the space, Wincek has. On the list of upcoming equipment for the Idea Lab: A laser cutter (which requires ventilation and is being explored in February), a vacuum forming machine to make molds, a soldering station, and basic woodworking tools. "One of the things that when you're looking at Maker Spaces that drives me nuts is that anyone who runs a Maker Space cannot tell you what you need in your Maker Space," Shingle says. "It's so community-dependent." So what populates the what's-coming-next list is determined by asking the users themselves, Shingle notes, adding that judging the attendance in the various classes they offer helps, too. Growth at the Idea Lab is poised to continue, as is its relationship to the entrepreneurial and innovation economies at Erie, as the Blasco Library is one of the Beehive Innovation Spaces funded through the Ignite Erie initiative led by the Erie County Gaming Revenue Authority. "As I saw these innovation spaces happening at our local universities, I knew we were on the right track with the Idea Lab," notes Dahlkemper, who says she's excited that the funders saw the value in the Blasco Idea Lab being a part of the Beehive network. "I've always said we're that earlier seed place that once people come in and start getting access to the resources and talking to our librarians — who have always been a resource for people — we can say 'you're ready to talk to one of the beehives at the universities.' That's the great thing about the library — it's the place that's so accessible to all." And that accessibility can make Blasco an attractive test bed for new ideas not launched in the Idea Lab. Dahlkemper notes that the County's Voting Machine Expo was held there as a means of introducing people to a new idea, as well as the new things happening at the library. "There were a lot of people interested in coming down to see the machines and it's not a technical library function, but we got hundreds of people coming into the library — some of them for the first time, and now they see the other things that are there," she says. "The library has become the 'town square.' We have to ask: How can we continue to be that space for the community?" she adds. One quick — and big — answer: Google. Grow with Google recently visited the Blasco Library on Friday, Feb. 1. Through a partnership with the American Library Association in 2019 to bring digital skills trainings to libraries across the U.S. to ensure that economic opportunity exists for all people, Grow with Google is traveling to 150 libraries over the next several months. That tour launched in Pennsylvania, with GwG selecting three libraries across the Commonwealth to visit and host this training: York County Public Library's Martin Library, the main location of the Free Library of Philadelphia, and the Erie County Public Library's Blasco Memorial Library. According to Wincek, Google picked Erie as their last stop on our tour of Pennsylvania "because the community, in particular our partners at the Erie Public Library, showed a real appetite for the free programs and workshops we offered." "When Google called to discuss the opportunity, our team worked to make sure our space and their vision would be a success," she adds, "not only was the Blasco Library an absolutely beautiful venue for their event, the space is approachable, allowing us to reach people with the opportunity." In the libraries, books and possibilities abound — from Blessing Bags to sewn pants to Google and beyond. "In a library today, you stumble across a book, or stumble across a person, a thing, an interaction," Wincek says, "something that can change your course of life in a lot of ways."